Hello. Well I have exciting news that I have to share. Sheena Douglass will be back on Create and Craft on Friday, Saturday and Sunday!!!!!!!!!!. Yes, 3 days in a row.........showing you all a new Oriental collection, but not just stamps, oh no, there are also backing papers and embossing folders!!!!. Wait until you see them all, they are fantastic. Now my first sneak peak is using the stamps and embossing folders. This is a large card and using clear embossing powder I have stamped the leaf image on to the base of the card, mat and layered and then distressed centura pearl card, and added some bling using primary pigments, followed by a spritzing of water. Once fully dry, I have stamped the images, and using the primary pigments coloured the lanterns. 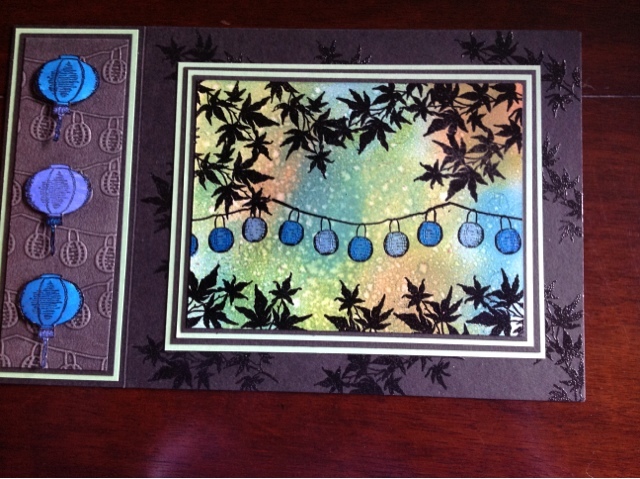 On the other side of the card, I have used the lantern embossing folder on black card stock, then waxed over the top with silver, again some mat and layering, then 3 larger lanterns added and coloured with primary pigments. I cannot wait for everyone to see this new Oriental range. Don't forget to watch. I will be back tomorrow with another sneak peak. This is just lovely, Caroline!